Political satire has a long and storied history. 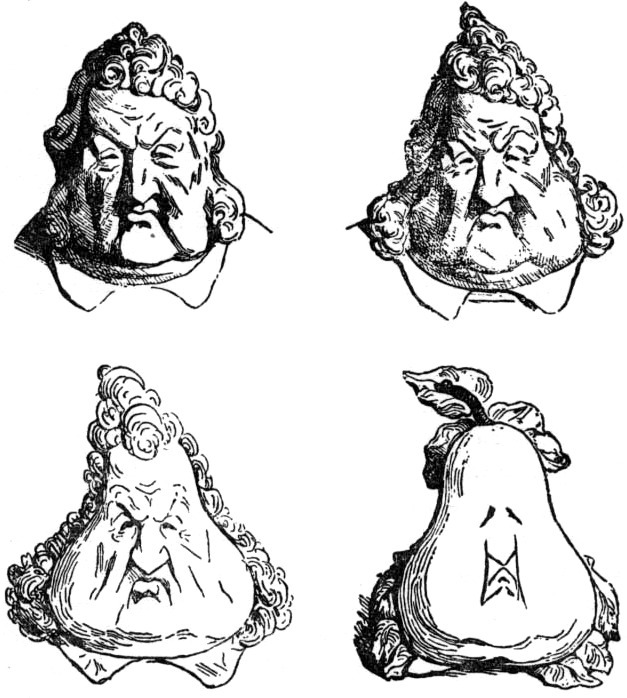 Honoré-Victorin Daumier (1808-1879) caricatured the French King Louis Phillipe turning into a pear, and often as corrupt. In 1835, the king reinstituted censorship of images, effectively curtailing Daumier’s most pointed political work. By the time Napoleon III took the throne, Daumier had become more careful, inventing Ratapoil, a political henchman of the new king that placed his critiques at a safer remove. Such commentary in art today is usually more explicit, owing to digital technology that makes it all too easy to incorporate actual photographs of the subject. Of course, their subjects in return attack the artists, but has any period ever provided such ripe targets as this generation’s overexposed and shameless crop of politicians? Sid Webb is an artist and activist who, now a "Senior Citizen", still takes to the streets with his wife to protest injustice and inequality. As a Kentucky resident, he need not look very far to find the conflict between ideologies and division that defines our age. Senate Majority leader Mitch McConnell (R-KY) draws his ire, as does the current President of the United States, Donald Trump. In a pointed commentary on the now infamous Access Hollywood video, Webb positions the 45th occupant of the Oval Office in conflict and contrast to a sexualized female figure that is both salacious (in its sheer, revealing lace) and innocent (the face of silent movie icon Clara Bow). The result is a bracing image of ego and arrogance run amuck that unfortunately has become an all-too common part of the Modern American Experience. There is little need to explain Webb’s point-of-view; the images speak for themselves. The artist has stated before that, “Art is a creation that aptly describes its time and place,” and perhaps that is the explanation necessary. The themes of corruption and the abuse of the people’s trust are here rendered in terms specific to today, but they are universal, the same as expressed by Daumier and others over time, and just as likely to keep being revisited over and over, for the next generation of artists to rail against. 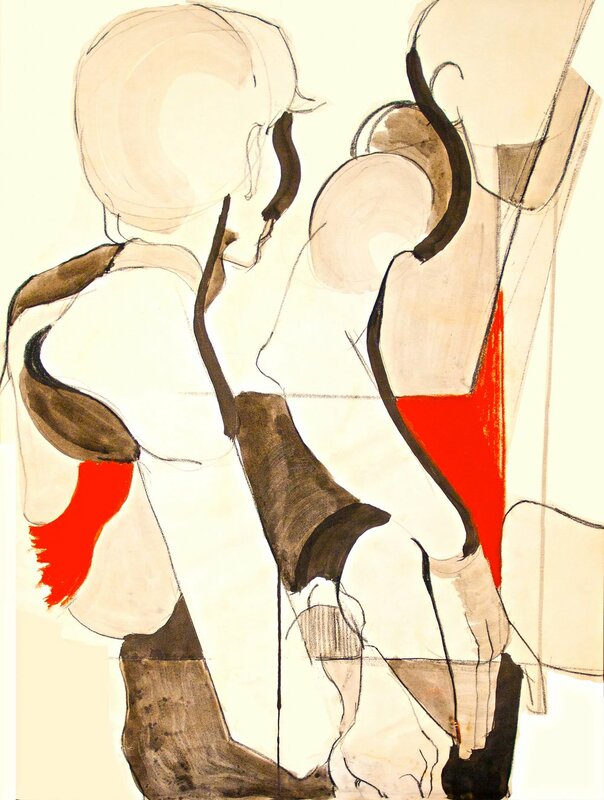 Webb works in a variety of mediums, and included here are figure studies that verge into the abstract. "Green Woman" merges the generous figure of an ancient fertility goddess with a Pop Art sensibility, capturing a Post Modern Feminism in loose gestural fashion and a note of sardonic humor. Written by Keith Waits. Entire text copyright © 2017 Louisville Visual Art. All rights reserved. Original works of art, copyright reserved by artist.